As a student in the early nineteen sixties, I had the privilege to attend winter seminars organized by my mentor, W Hoppe, and by M Perutz, which took place in a small guesthouse in the Bavarian, Austrian Alps. The entire community of a handful of protein crystallographers assembled in a room which served as living and dining room and as auditorium for the lectures. Today structural biologists organize large congresses with thousands of attendants and there exist many hundreds of laboratories specialized in this field. It appears to dominate biology and biochemistry very visibly if we count covers in scientific journals displaying macromolecular structures. Structural biology was successful, because it was recognized that understanding biological phenomena at the molecular and atomic level requires seeing those molecules. Structural biology revealed the structure of genes and their basic mechanism of regulation, the mechanism of enzymes’ function, the structural basis of immune diversity, the mechanisms of energy production in cells by photosynthesis and its conversion into energy- rich chemical compounds and organic material, the mechanism that makes muscle work, the architecture of viruses and multi-enzyme complexes, and many more. New methods have an essential impact on the development of structural biology. Methods seem to become available in cadence with the growing complexity of the problems and newly discovered methods bring biological problems within reach for researchers, a co-evolutionary process of the development of methods and answerable problems, not only in the field of x-ray diffraction, but also in optical microscopy, nuclear magnetic resonance, and electron microscopy. An important additional incentive for structural biology came from its potential application for drug design and development using knowledge of drug receptor structures at the atomic level combined with theoretical approaches of ligand binding. The commercial interest in application spurred this direction of research enormously. My lecture will focus on protein crystallography and start out with the major factors contributing to its development. Few examples shall illustrate how structure information contributes to our understanding of the physical and chemical basis of biological phenomena and may lead to medical application. I then will let you share my experience with the foundation and development of two biotech companies with different business models, but both based on basic academic research in structural biology: Proteros (www.Proteros.com) offers enabling technology services for pharma- and crop science companies imbedding all steps of the workflow molecular and structural biology can provide and commands and uses its platform for the generation of leads from identified targets to in vivo Proof-of-Concept (PoC). Suppremol (www.Suppremol.com) specializes in the development of novel immune-regulatory therapeutics for the treatment of autoimmune diseases on the basis of a recombinant, soluble, non-glycosylated version of the human Fcg receptor IIB and of receptor binding antibodies. Suppremol was recently acquired by Baxter International Inc. (NYSE:BAX) offering an ideal setting for its therapeutic projects. Zhong Lin Wang is the hightower Chair in Materials Science and Engineering, Regents' Professor at Georgia Tech, and Director of Beijing Institute of Nanoenergy and Nanosystems. He has made original and seminal contributions to the synthesis, discovery, characterization and understanding of fundamental physical properties of oxide nanobelts and nanowires, and their applications in energy sciences, sensors, electronics and optoelectronics. His discovery and breakthroughs in developing nanogenerators establish the principle and technological road map for harvesting mechanical energy from environment and biological systems for powering mobile sensors. He first showed that the nanogenerator is originated from the Maxwell’s displacement current, revived the applications of Maxwell’s equations in energy and sensors. His research on self-powered nanosystems has inspired the worldwide effort in academia and industry for harvesting ambient energy for micro-nano-systems, which is now a distinct disciplinary in energy science for future sensor networks and internet of things. He coined and pioneered the fields of piezotronics and piezo-phototronics by introducing piezoelectric potential gated charge transport process in fabricating strain-gated transistors for new electronics, optoelectronics, sensors and energy sciences. Developing wireless nanodevices and nanosystems is of critical importance for sensing, medical science, environmental/infrastructure monitoring, defense technology and even personal electronics. It is highly desirable for wireless devices to be self-powered without using battery. 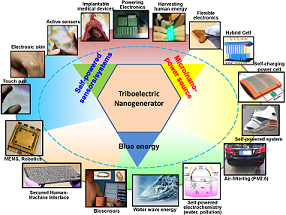 Nanogenerators (NGs) have been developed based on piezoelectric, trioboelectric and pyroelectric effects, aiming at building self-sufficient power sources for mico/nano-systems. The output of the nanogenerators now is high enough to drive a wireless sensor system and charge a battery for a cell phone, and they are becoming a vital technology for sustainable, independent and maintenance free operation of micro/nano-systems and mobile/portable electronics. An energy conversion efficiency of 55% and an output power density of 500 W/m2 have been demonstrated. This technology is now not only capable of driving portable electronics, but also has the potential for harvesting wind and ocean wave energy for large-scale power application. This talk will focus on the updated progress in NGs. For wurtzite and zinc blend structures that have non-central symmetry, such as ZnO, GaN and InN, a piezoelectric potential (piezopotential) is created in the crystal by applying a strain. Such piezopotential can serve as a “gate” voltage that can effectively tune/control the charge transport across an interface/junction; electronics fabricated based on such a mechanism is coined as piezotronics, with applications in force/pressure triggered/controlled electronic devices, sensors, logic units and memory. By using the piezotronic effect, we show that the optoelectronic devices fabricated using wurtzite materials can have superior performance as solar cell, photon detector and light emitting diode. Piezotronics is likely to serve as a “mechanosensation” for directly interfacing biomechanical action with silicon based technology and active flexible electronics. This lecture will focus on the updated progress in the field and its expansion to 2D materials.